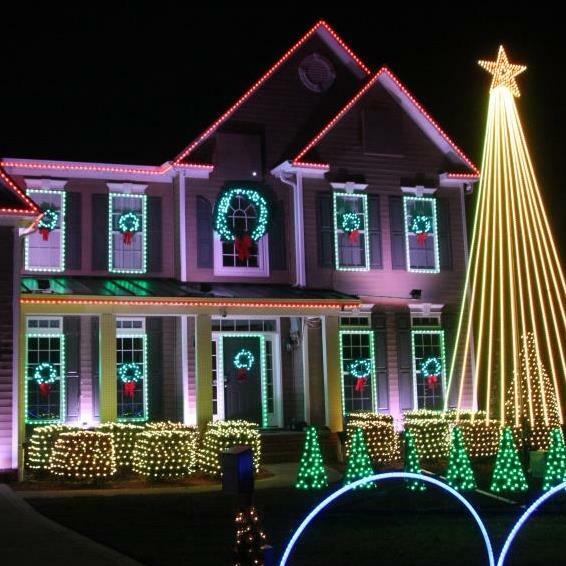 In 2012, we had 7300 traditional Christmas lights and almost 1400 LED lights outlining the house. All of this is controlled by a computer system switching 4140 channels of electricity. For the 2013 season, we added 14,820 channels for a total of 18,960 channels. In terms of lights, 6,320 LED RGB lights and 7300 traditional Christmas lights. In the 2014 season, we will came close to doubling our total light counts. For 2015, we added another 2000 LED Pixels to the display. The LED lights we are using are individually controlled lights. We can make each and every LED it's own color. As you will see in our display, we can sweep color across the house or make patterns that will be unique or impossible to most other displays that can only flash or dim the lights of the same color. Please remember to tune your radio to 94.5 FM to hear the music. We originally started to put our light show together in 2010. It took over 2 years of planning before we would be able to turn on our first light. While building the elements for the 2012 show, my wife and I could not decide what organization we would raise money for or even if we would collect money. Many displays do raise money, but it did not mean we needed to. In September 2012, the decision was made for us. I was given news that a member of my family had been diagnosed with pancreatic cancer. This type of cancer is not survivable, it is the most aggressive, causes more than 1% of all deaths in the US, and is one of the least funded of the major cancers. Donations will be collected at the show in the donation box to help fund The National Foundation for Cancer Research. If you would like to donate by Credit Card, please use the donation button located in the menu. 100% of all the money donated will go directly to them.